More than 4,700 solar panels will be installed over the next three months on five structures at UC San Francisco and on the surface parking lot at UCSF Fresno. The six projects will produce approximately 3.1 million kilowatt hours (kWh) of renewable, emissions-free electricity per year. That’s about four percent of the annual electricity used at UCSF and is enough to completely power 446 average California homes. The project is expected to save UCSF about $3.7 million in utility costs over the 25-year contract with SunPower. “This has been a complex project taking several years of research, planning, and negotiations to reach the point of installation,” said James Hand, energy manager for UCSF Facilities Services. Hand said the majority of UCSF’s new construction projects are being built solar-ready, and the university plans on adding solar to those buildings during a future phase of the solar project, closer to when the new buildings open for occupancy. Occupants of buildings impacted will be notified of their area’s specific construction timeline. Some parking may also be disrupted, with notification being issued to parkers as needed. Hand said UCSF currently has 246 kilowatts of solar capacity installed onsite from previous solar installations on the 3rd Street Garage, Genentech Hall, and Aldea Conference Center. 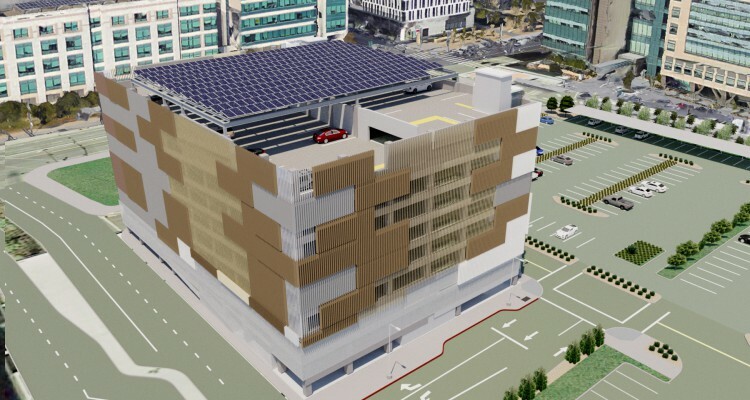 This current project will increase UCSF’s onsite solar capacity to 2,042 kilowatts and over the lifetime of the contract the project will reduce UCSF’s emissions by about 10,631 metric tons of carbon dioxide.